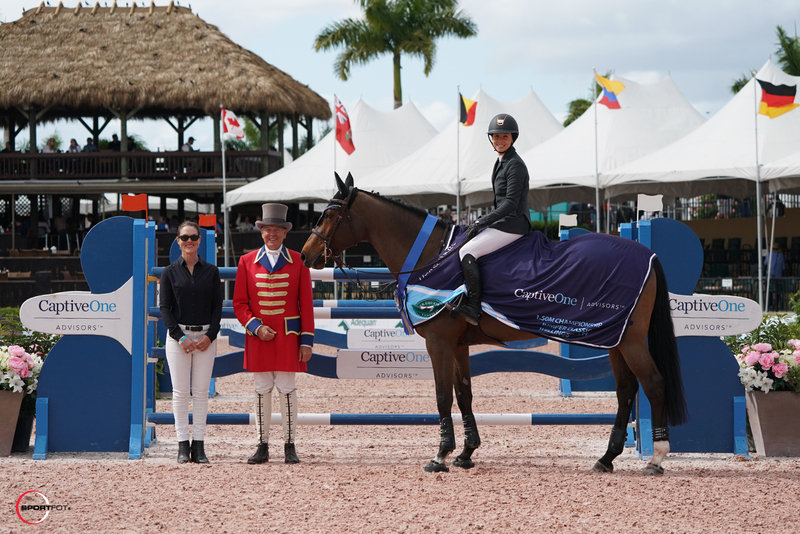 Wellington, FL – January 12, 2019 – The first week of the 2019 Winter Equestrian Festival (WEF) continued on Saturday, January 12, with a win for Adrienne Sternlicht in the $25,000 CaptiveOne Advisors Classic. 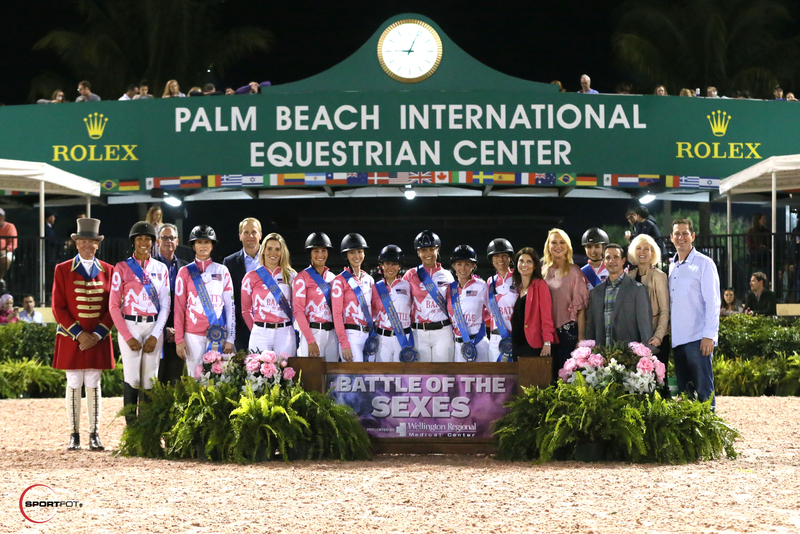 The women’s team was victorious in the $75,000 Battle of the Sexes, presented by Wellington Regional Medical Center. 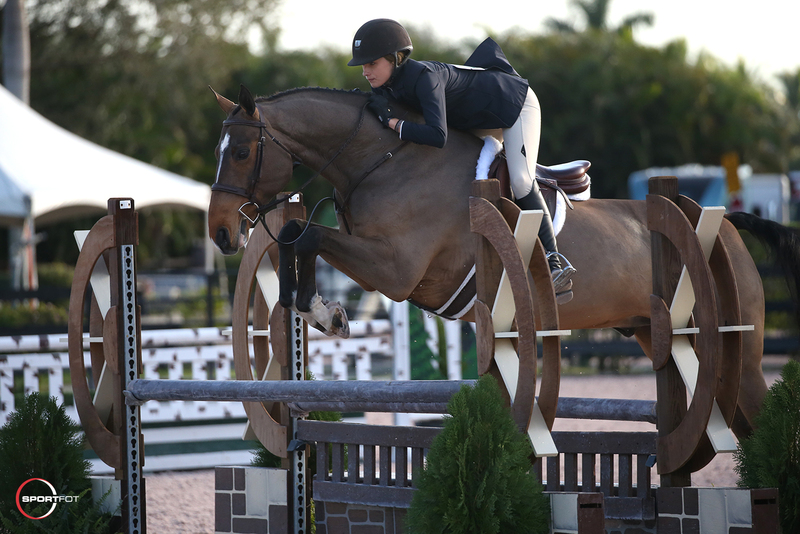 In the hunter ring, Maggie Hill and O’Ryan took home the Small Junior Hunter 16-17 championship. 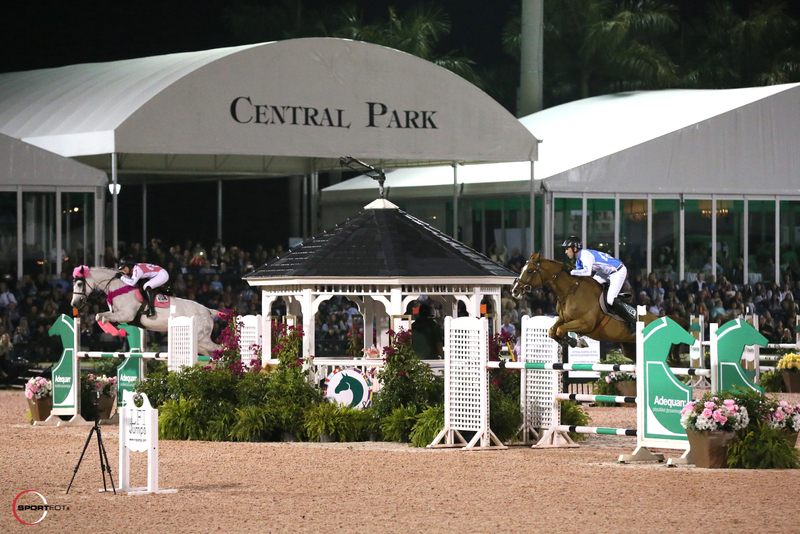 WEF continues with 12 consecutive weeks of world-class competition through March 31, 2019. 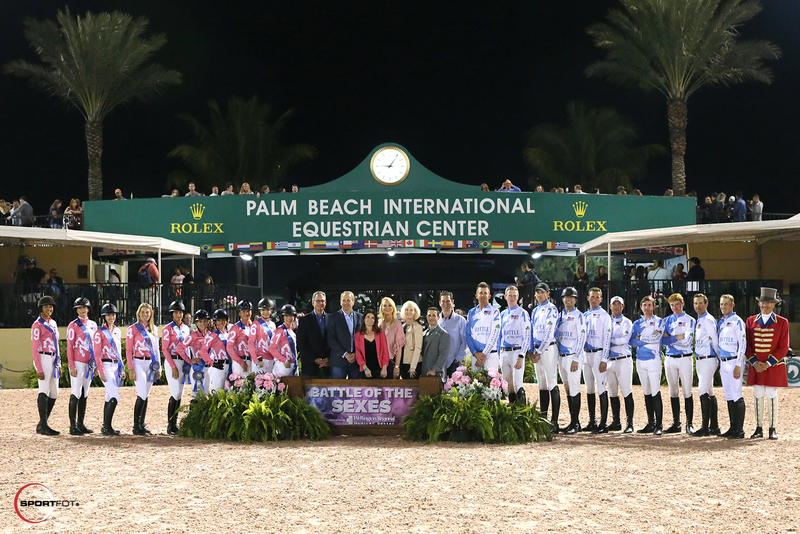 The first week of competition at WEF is sponsored by Wellington Regional Medical Center and concludes on Sunday with the $75,000 Rosenbaum PLLC Grand Prix at 2 p.m. The winning women’s team with ringmaster Steve Rector and Marvin Pember, Keith Alexander, Pam Tahan, Robbin Lee, Dr. Nicholas Sama, Jackie Leibowitz, and Dr. Adam Bromberg of Wellington Regional Medical Center. Photo © Sportfot. 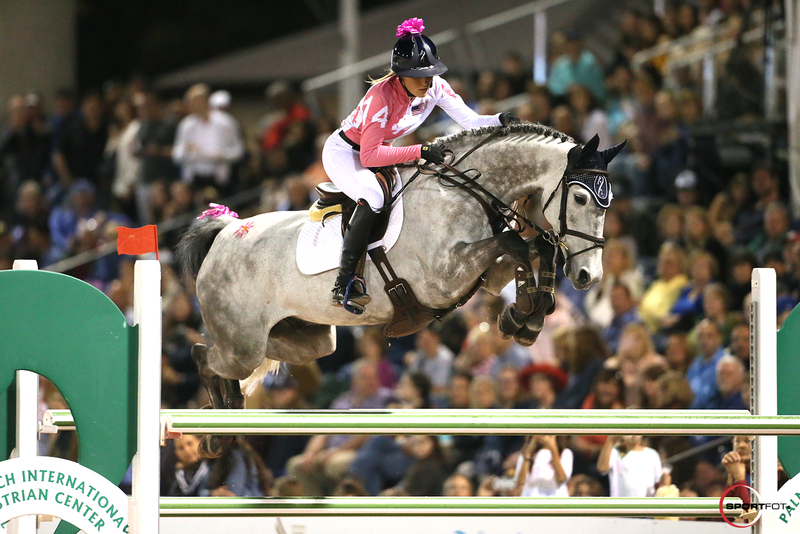 Jessica Mendoza had the fastest speed round of the first phase. Photo © Sportfot. Women’s team captain Nicole Bellissimo. Photo © Sportfot. Team captain Nicole Bellissimo, participating in her seventh Battle of the Sexes and third as captain, was ecstatic with the win. She was joined by teammates Mendoza, Anthony, Van Aarem, Shulman, Abigail McArdle (USA), Taylor Land (USA), Amanda Derbyshire (GBR), Maggie Jayne (USA), and Kristen Vanderveen (USA). The men’s team was captained by Charlie Jayne (USA) and included Coyle, Blake, Bourns, Alex Granato (USA), Darragh Kenny (IRL), Michael Tokaruk (USA), Andrew Welles (USA), Spencer Smith (USA), and Andy Kocher (USA). Men’s team captain Charlie Jayne. Photo © Sportfot. Adrienne Sternlicht and Just A Gamble. Photo © Sportfot. “[It] was really not doing too much flatwork because she’s super hot,” said Sternlicht of the 10-year-old BWP mare by Toulon x Corofino. “We’ve put her on what we call the ‘Rothchild Program’, which is a lot of walk/trot work, a lot of trail riding, trying to get her to settle a bit. It’s almost better if she’s more unfit than fit. Even with her build and technique, she’s a powerhouse behind, she has all the scope in the world. It’s about keeping her mentally calm. Adrienne Sternlicht and Just A Gamble in their winning presentation with Laura Southard, Brand Ambassador for CaptiveOne Advisors, and ringmaster Steve Rector. Photo © Sportfot. This was the pair’s first jump-off together, and they went third in the jump-off with plans to be neat and stick to the plan, which paid off with the victory. 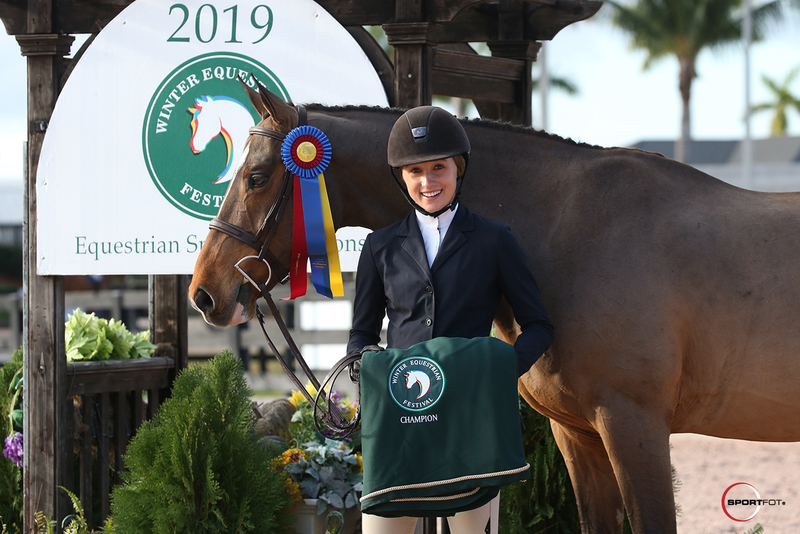 The Small Junior Hunters 3’6 16-17 riders returned to Palm Beach International Equestrian Center on Saturday to contend for the championship title of Week 1. After two firsts, a second, and a fifth over fences along with another second under saddle, Maggie Hill of Jackson, WY, took home the tricolor ribbon. Hill piloted Stella Styslinger’s O’Ryan, a 17-year-old bay Holsteiner gelding, to consistent top placings with two firsts, two seconds, and a fifth. 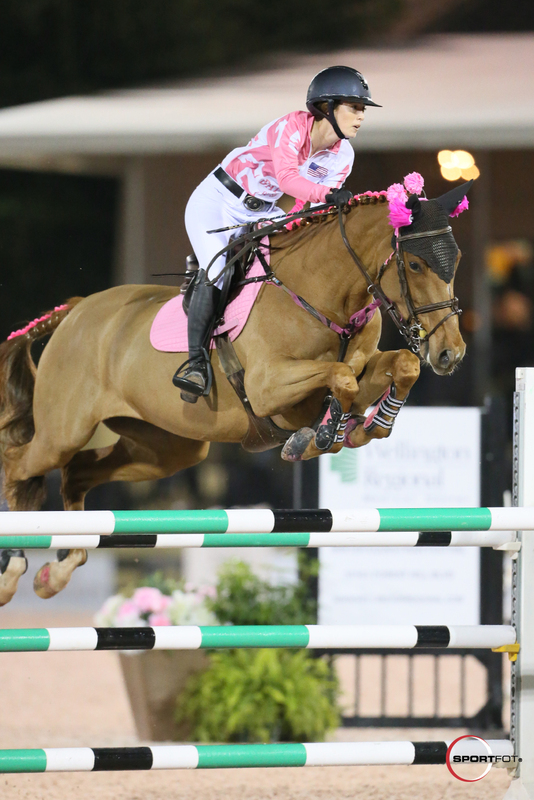 She and O’Ryan have been successful partners for the past two years under the careful tutelage of three-time USHJA International Hunter Derby Championship winner Liza Boyd. The pair have been successful with their junior hunter endeavors, but Hill hopes to compete the veteran hunter in several derbies throughout the rest of the season. Jordan Allen of West Bloomfield, MI, captured the reserve champion title aboard Airplay. Airplay is an eight-year-old Belgian Sport Horse (Tin Tin De La Pomme x Flavie De Roloux)owned by Don Stewart. 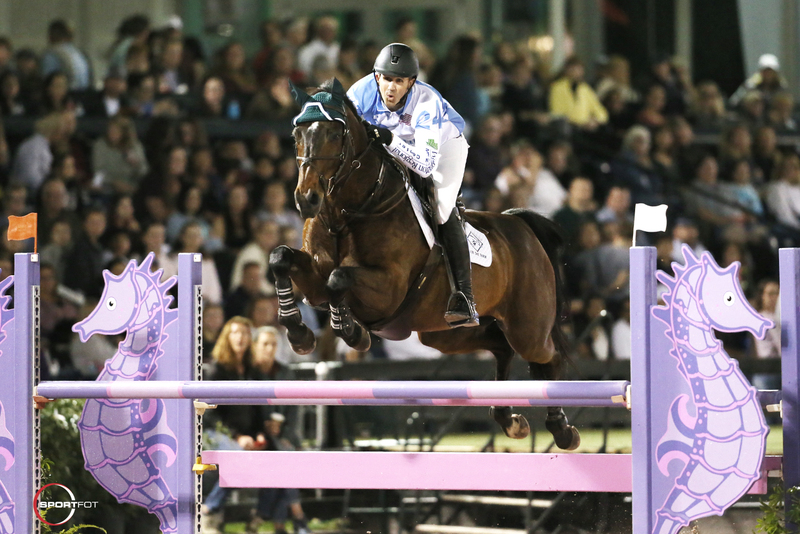 The final day of competition during Week 1 of the Winter Equestrian Festival will kick off Sunday, January 13. 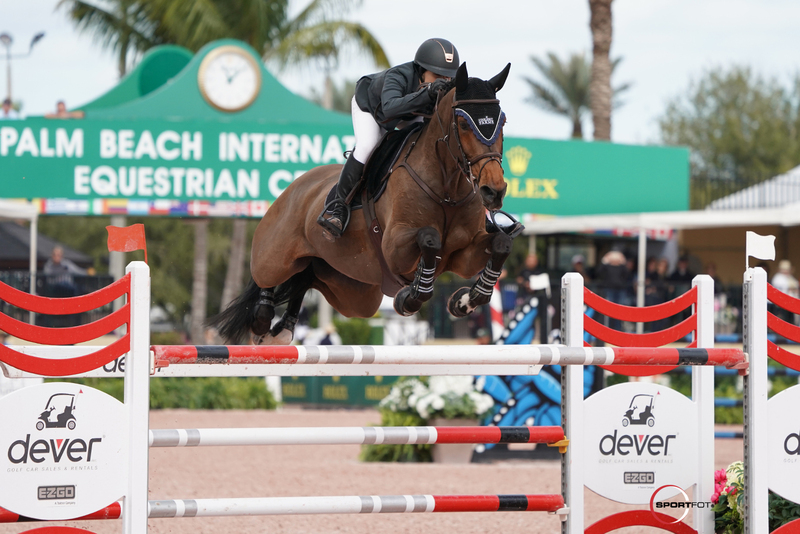 The $75,000 Rosenbaum PLLC Grand Prix will take place in the International Arena at 2 p.m. while equitation riders can look forward to Maclay and USEF Hunter Seat Medal classes. For a full list of results, visit www.PBIEC.com.